Hot Tea for Sore Throat! Cold and Flu season is slowly creeping upon us, which means that I’m writing down all my natural remedies in case I do catch a cold within these next few months. I’m a firm believer in using all-natural remedies as a way to help relieve and prevent any sort of sickness. Coconut oil is my go-to ingredient for fighting cold and flu symptoms due to its anti-bacterial and anti-viral properties. In order to help prevent myself from getting sick and keep my immune system boosted, I consume coconut oil at least 3 times per week. Putting it on toast, in my oatmeal, or on top of steamed veggies are great ways to get in my serving of healthy fats. Personally, I have noticed a big difference in my immune system since consuming healthy fats regularly – love it! 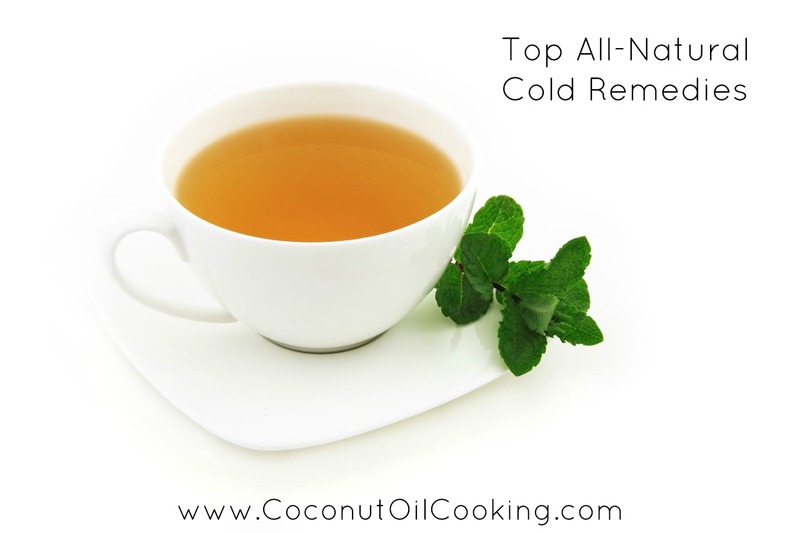 Here are some of my favorite all-natural cold remedies which may come in handy the next time you’re not feeling your best. Oil Pulling – Using coconut oil for oil pulling can be effective when feeling under the weather. I have had multiple friends tell me that they do this as soon as they start to get a sore throat. I even have one friend who swears by the oil pulling method for sinus infections. Anything is worth a shot when you’re not feeling good! To try oil pulling, take 1 tablespoon of coconut oil and swish it around in your mouth for 10-20 minutes. Vapor Rub – As a child, I can’t tell you how many times my mom would try to push store bought vapor rub on me when I was sick. I always hated the smell and burning sensation that would occur when rubbed onto the chest or nose. Now that I’m older, I use this DIY vapor rub recipe, which contains coconut oil and essential oils. Let me tell you, the smell is much less intense and works just the same for me. Try this vapor rub the next time you have a stuffy nose or head cold. Cough Drops – Making your cough drops with coconut oil and honey is a great way to get anti-bacterial benefits from both ingredients, which is especially important when you have a cold or sore throat. You could also make these into cough drop lollipops by laying down a candy stick and pouring the mixture at either end and allowing to cool on parchment paper – great for little ones! Hot Tea – I’m not the biggest fat of hot tea, however it’s definitely good for soothing a sore throat. I put a tablespoon of coconut oil and honey in my hot to help coat my throat if sore and soothe any redness. 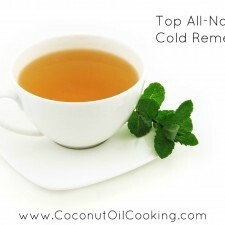 Again, you’re getting great anti-bacterial agents from both the coconut oil and honey when consuming this tea. Smoothies – I’m the first to not want to eat when I’m sick, but I can’t tell you how important it is to keep eating. Smoothies are one of the best ways to get down fruits, vegetables and even protein if you decided to add a protein powder into your mix. Reach for fruits packed with vitamin C and green vegetables, such as spinach and berries for antioxidants. Add a tablespoon of coconut oil into your smoothie for added healthy fats! This Green Berry Protein Smoothie is my go-to recipe. Do you have a remedy for fighting a cold that works wonders? Feel free to share!